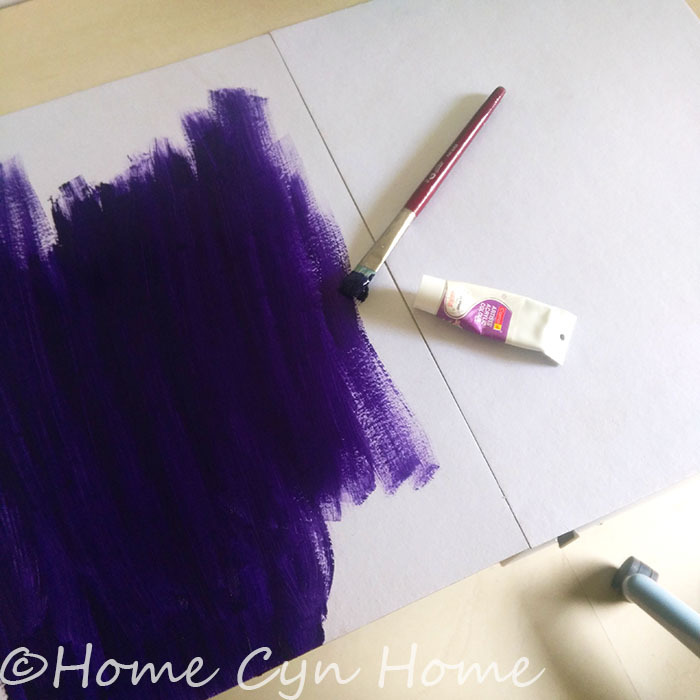 It's been a little while I haven't done a DIY post on the blog, and it was long overdue. As long overdue as the mood board it is all about. When we moved into this flat last April, the study while smaller than in our previous flat, still felt a bit bare. And there was one bit of wall I knew I wanted to turn into a mood board. Since I am an artist, mood board sounds more appropriate than bulletin or message board but rest assured they are the same thing. And, I will not lie, I found myself longing for IKEA to open in Mumbai already (still a long wait to go). Growing up, I had a very versatile framed cork board from there. It was above my desk in my childhood's bedroom. I used to pin pictures, magazine snippets and notes, in my teenage years it had more Boys bands pictures (New Kids On the Block anyone?) than memos and notes. 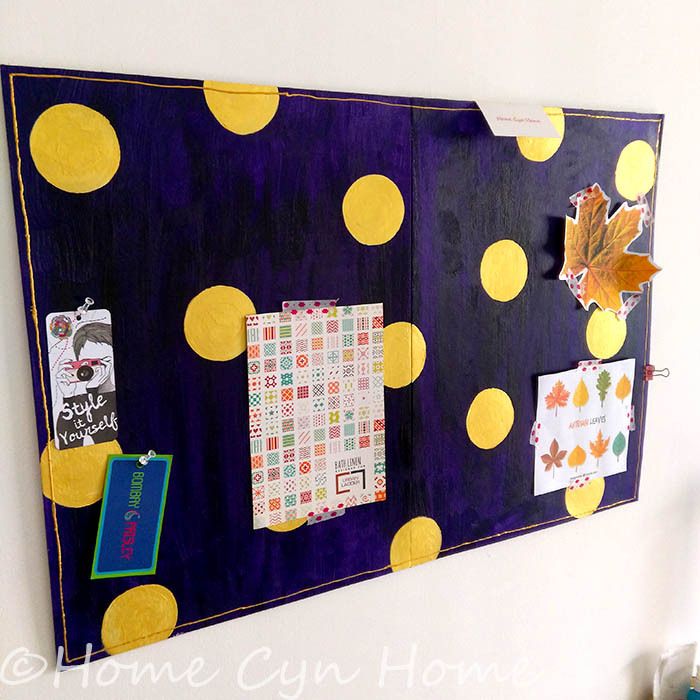 When I moved into my first grown up Studio apartment, the board came with me, but it got a bit of a makeover as the years had left it with holes in the cork and a faded wooden frame. I flipped it and painted it a deep burgundy red back then. It held my very grown up to-do lists, pictures and home decor inspiration then. Man! I miss that board! Sadly, no quality wooden framed cork board is really available at a decent price around here (believe me I looked), and the more I went thinking about, the least I saw myself with an all natural board anyway. A lot of thinking, a lot of idea's browsing and I figured out I didn't really need a permanent solution right away. This project required only two A3 sheet of cardboard from the stationery store, a bit of paint and best of all doesn't even require holes in the wall (more on that below). The chances are that by the time it's worn out I will be in the mood for new colors, that or IKEA would have opened its door in India (and hopefully have an online store). In the meantime, I have a place to display all my inspirations where I can see them and it fills that blank in my home office. As I said, the project started with me buying and then taping together 2 sheets of A3 cardboard. Then, I painted it purple. Because the cardboard is still fairly thin and prone to warping under moisture, I used my artist Acrylic paint undiluted, straight from the tube onto the board. This means I used quite a lot. 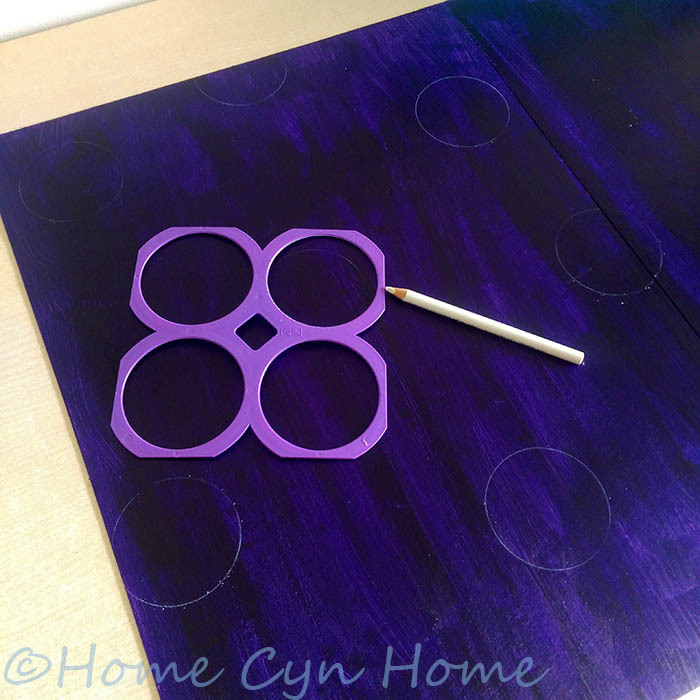 Once the paint was dry, I used a white chalk pencil to draw circles all over. And, yes, the purple "tool" is a plastic frame that was holding 4 pots of fruit yogurt at one point. I keep this type of stuff for my arts and craft purpose because I believe in up-cycling thing as much as I can and craft supplies don't have to all cost you a fortune. Those yogurt ring also make for a wonderful compass tool to make things like this flower mandala art. 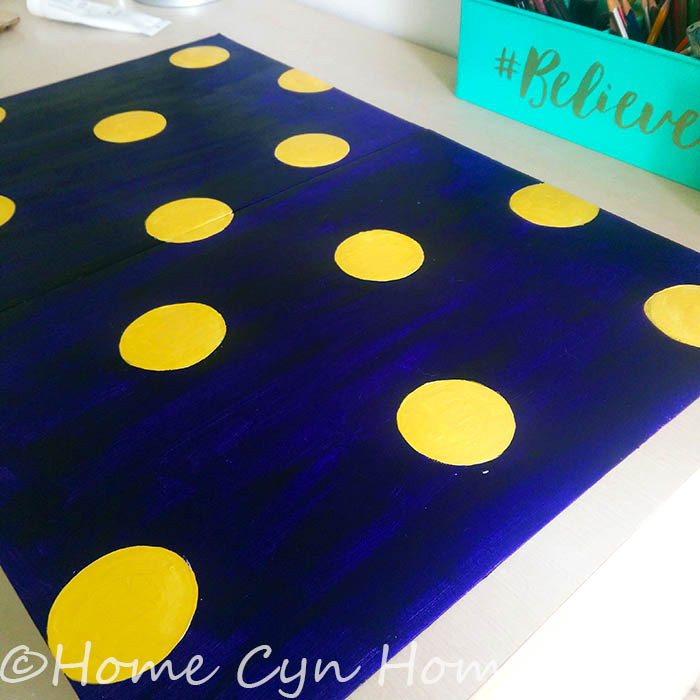 I then colored the polka dots with gold paint. Actually, I first did one layer of white paint as a primer, and topped it with a layer of gold because the gold paint I own is semi-transparent and I needed my dots to pop. This is called "Blu-Tack" and I am forever grateful to my friend for introducing me to it! This is a re-useable gummy adhesive that sticks to the wall and whatever thing you want to put on said wall. It leaves no marks when you peel it off (unlike scotch tape) and will hold a great deal of weight as well. This is how it looked right after it went up on the wall and before I started adding stuff to it. It fills a wall gap above an old CD tower (we don't even have a music system to play those CDs anymore) and a rather unsightly mess of charging cables and a paper bin. 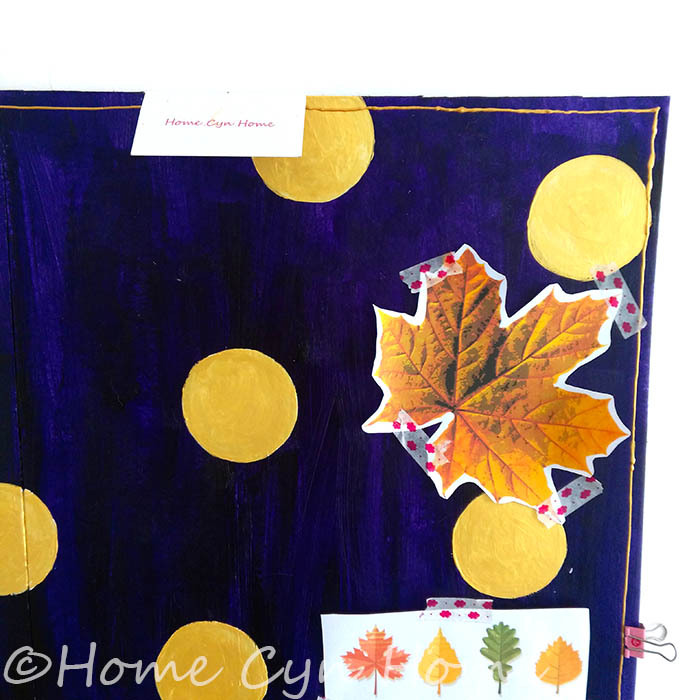 Since I am currently working on creating some Autumn themed art, I taped some fall leaves printouts to the board. I used washi tape to do the job, because it has less of a chance ripping the paint off my board than regular tape. Plus it looks far cuter that way. Pins will also work on that board but will go all the way through and into the wall, so to preserve the wall underneath, I used two pins at an angle to hold some inspirational tags (you can see them in the first picture). All in all, this project only costed me the price of the two cardboard sheet which was 50 rupees. I had the paint on hand already, so with the amount of paint I used plus the board I am still under 100 rupees of rough material for that project. We'll all agree it's a steal! Lovin' that purple with the polka dots! 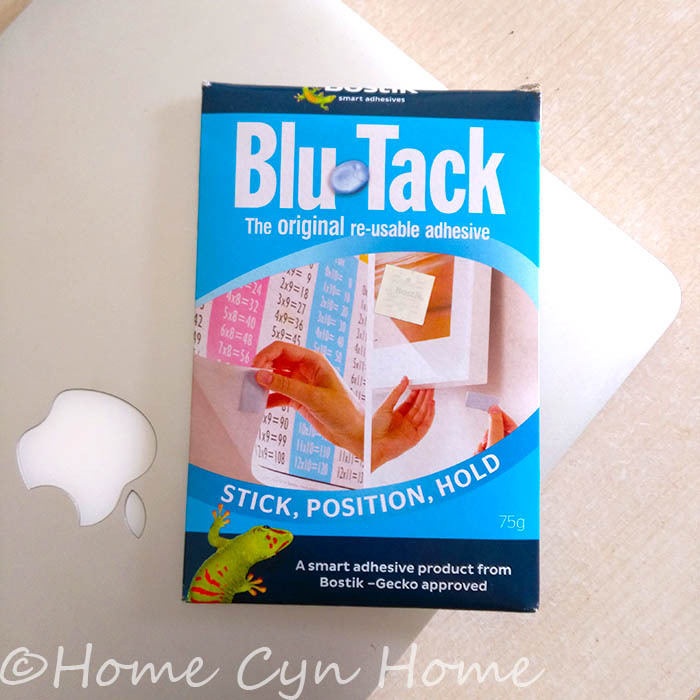 Is blu-tack that putty-like adhesive? I winder if IKEA (or any foreign business) will ever come to India after the demonetization fiasco & GST? Yes Blu Tack is the putty like adhesive, that thing really rocks. As far as I know Ikea is all set to open its first store in Hyderabad Early 2018 which will be followed later by a store in Navi Mumbai, they are currently building that Navi Mumbai store, there was a whole first stone ceremony thing a few months ago. It took them years to process the red tape associated with foreign investments in India and at one point they were in a huge dispute over the cafeteria thing, which we all know is an integral part of the IKEA model but didn't bode well with whatever governement office in India is in charge of the whole thing. It seems that dispute has been resolved though. 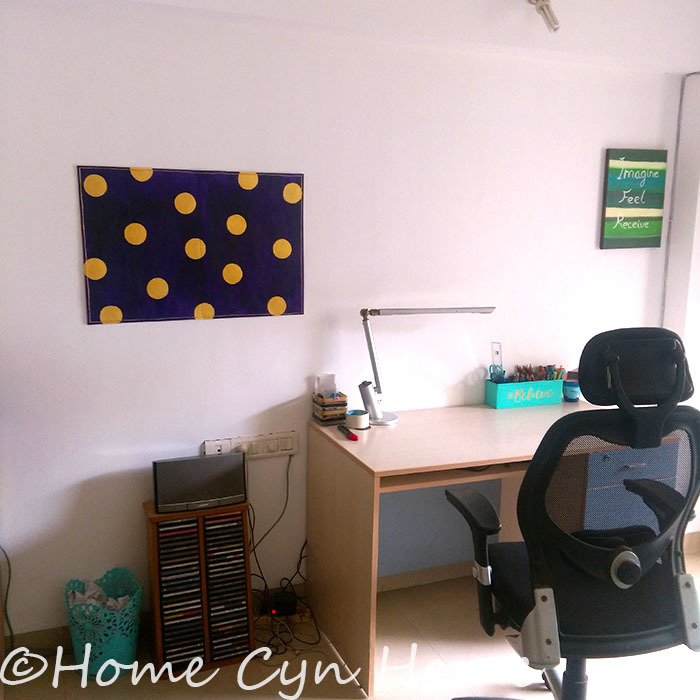 IKEA had to increase the amount of products they produce in India too from what I learned. They also are rethinking the whole "grab and build yourself model" as this one is not going to be super popular with Indians who are into the habit of outsourcing any petty manual job to cheap labourer. Home delivery is likely to be part of the whole price because cars are rather small in India. I remember when I was growing up, my mom and a friend where both going through a divorce and starting over with new furnitures and stuff, we used to take both my mom's station wagon and our family friend's van to carry the big furniture packs. Had to lower the seats to squeeze them in. Not something you can do easily with a compact city car. Fantastically colourful like the thoughts of human mind. I was wondering, if u don't mind, since the Independence Day is round the corner, why don't u try a project on this theme. No, I'll never get into a patriotic project, let's not forget that even if I married an Indian, live in India, I am still Swiss. Then there is the other issue of me being against patriotism, I stayed away from Swiss flag themed projects and decor my whole life, I'm going to do the same with the Indian flag. I think there are other ways to be proud of a country, less ostentatious, and more constructive.